Using body condition scoring as an assessment tool within your cow herd can be one of the cheapest and most beneficial items you have in your herd management toolbox. It can be even more beneficial when the temperatures drop even if for a short period of time. Lower temperatures can negatively impact the forage quality making it difficult for cattle to maintain their body condition throughout the winter. It is important to provide adequate quality forages and supplementation for the cow herd based on the stage of gestation and lactation they are in and how severely the forage quality drops in your area. 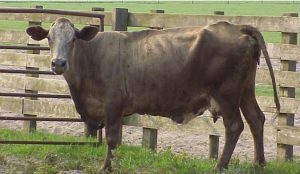 If the herd is not at a proper plane of nutrition once breeding season begins, conception rates and calf performance may be drastically impacted. The common chart used to score body condition in beef animals is a scale ranging from 1 to 9, with 1 being the lowest and most emaciated of the scale while 9 is the highest in percentage of body fat present. 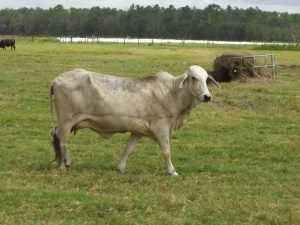 In general, the two ends of the BCS spectrum are not seen routinely in cow/calf production. 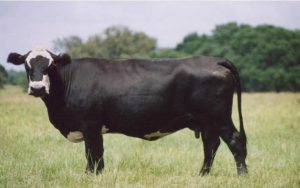 It is more common for a cow to fall between a 3 and 6 on the scale. Due to this occurrence, those classifications are the ones listed below. However, if you would like to learn about all of the classifications on the scale or have additional questions, your local livestock agent will be happy assist you. A BCS of 3 is at the top of the thin category (BCS 1, 2 and 3). This animal will have a small amount of fat cover over the back, loin and forerib areas. The upper portion of the skeleton will be obviously visible. The ribs will also be easily visible. There will be no apparent body fat. A BCS of 4 is the lowest classification in the moderate grouping. This animal will exhibit a slight covering of fat in the forerib while the hind ribs are still visible. The spinous processes will not look or feel as “sharp”. The upper portion of the skeleton are still visible, but not as prominent as in the BCS 3 animal. There will be a discernable amount of muscle tone throughout. 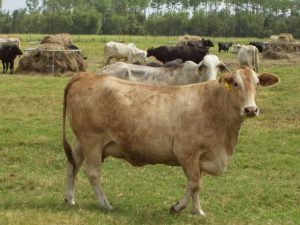 A BCS of 5 is considered to be a moderate condition score for mature beef animals. This score is characterized by hooks and pins that are visible but not obvious. The ribs have a fat cover, but the last rib may still be visible. The areas around the tailhead are starting to fill out and the muscle tone is nearing its maximum. This is considered a target BCS for many producers. If you would like to learn more about body condition scores or feeding your cow herd contact your local Extension Office or consider attending the Nutrition for Beef Females Seminar. Click here to view the flyer. Pre-registration is required. Hersom, M., Thrift, T., and Yelich, J. 2015. “Implications of Cow Body Condition Score on Productivity.” UF/IFAS EDIS Publication, no. AN319.